Benson & Bingham hires new Associate, Danielle Richardson Esq., a native of Las Vegas who graduated from the University of Nevada, Reno and went to Law School in Oregon. Mrs. Richardson is working from the Summerlin location and has a very active case load handling exclusively personal injury matters. Ida Ybarra Esq., celebrates her 2nd anniversary with Benson & Bingham as the supervising attorney of the Worker’s compensation division. Within two years, the workers compensation cases have grown to over 250 cases. Benson & Bingham is the exclusive local firm for national firms Morgan & Morgan, and Pond Lehocky Stern & Giordano whom refer their matters to Benson & Bingham. Benson & Bingham announces intention to expand to the Reno market in Northern Nevada. Per Attorney Mr. Benson, “Its a natural fit for us to open an office in Reno as we currently handle cases in Northern Nevada from Elko to Douglas County, and a physical presence will only support those clients. Moreover, we have ties to the Reno/Tahoe area as I grew up in Incline Village and attended high school in Reno-we look forward to the growth potential Reno offers.” The office is expected to be opened 1st quarter of 2019. Wooster High School designates scoreboard banner in honor of Benson & Bingham for its support of Wooster's football program. The banner was installed in August 2018 in recognition for the financial support for the program’s equipment needs. 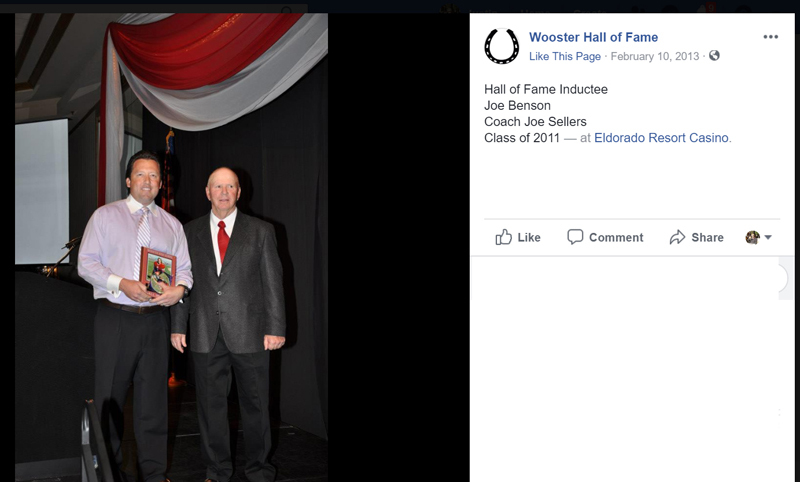 As a Hall of Fame football alumni of Wooster, Mr. Benson was excited to give back to the program that was so instrumental in his early success. Head football coach Bo Sellers is stepping into the family legacy of his father continuing the success of Joe Sellers’ stellar career at Wooster High School.